Informații produs "Pungi reutilizabile reci-calde"
Features: Hot/cold gel pouches, REUSABLE. Two-layered. Inner printing that avoids stains during its application. It does not discolour. Side welding. Size: 270x130 mm. Weight: 400 grs. Packaging: Package 1 unit. Use: Situations in which the application of cold or heat is needed. Monitor the period of use to avoid frostbite or burns caused by excessive heat or cold. Instructions: Cold: Leave the pouch in the freezer for at least one hour. Take it out, wrap it in a dry towel, and put it on the treatment area. When you finish, put it back in the freezer. Heat: With boiled water: Dip the pouch for 8-10 minutes in a container with freshly boiled water. Take it out and apply it wrapped in a towel. When you finish, let it cool down and put in back in the freezer. With microwaves: Dip the pouch in a container with water. Switch on the microwaves at 600 wat for three minutes. If you need to heat it more, do it in periods of 30 seconds. The pouch must always be dipped. Apply it wrapped in a towel. When you finish, let it cool down and put in back in the freezer. Bolsas de frío-calor reutilizables, 20 uds. 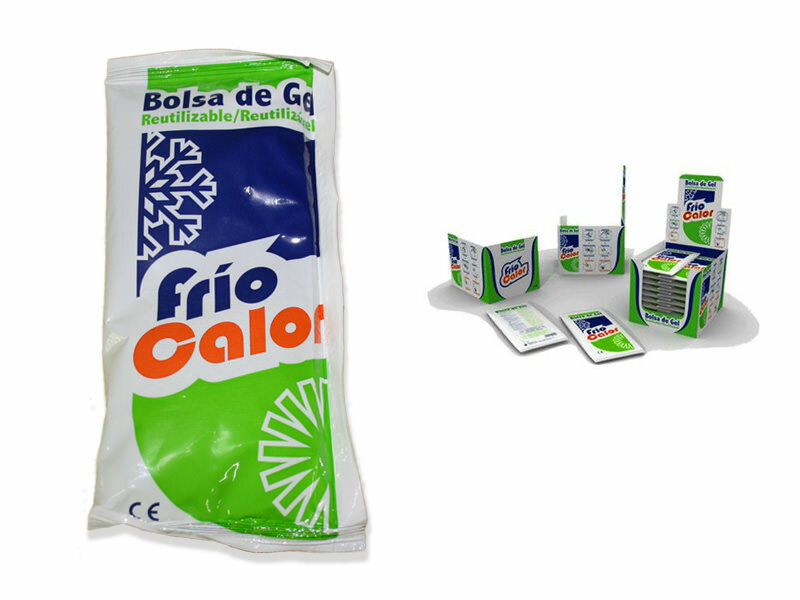 Características: Bolsa de Gel frío/calor, REUTILIZABLE. Fabricado en complejo bicapa. Impresión interior que evita manchas durante su aplicación. No destiñe. Soldaduras laterales. Medidas: 270x130 mm. Peso: 400 grs. Presentación: Cajas de 20 unidades. Uso: Situaciones en las que se requiera aplicación de frío o calor. Deben controlarse los tiempos de aplicación y evitar congelaciones o quemaduras producidas por el exceso de frío o calor. Instrucciones: Frío: Deje la compresa en el congelador durante una hora al menos. Sáquela del congelador y, envuelta en una toalla seca, aplíquela sobre la zona deseada. Después de usarla, devuélvala al congelador. Calor: Mediante hervido: Sumerja la compresa durante 8-10 minutos en un recipiente con agua recién hervida. Saque la compresa y aplíquela envuelta en una toalla. Después de usarla, déjela enfriar y devuélvala al congelador. Mediante microondas: Sumerja la compresa en un recipiente para microondas con agua. Ponga en marcha el microondas a 600 wat durante tres minutos. Si necesita calentarla más, hágalo en periodos de 30 segundos. Mantenga la compresa siempre sumergida. Aplique la compresa envuelta en una toalla. Después de su uso, déjela enfriar y devuélvala al congelador. Link-uri către "Pungi reutilizabile reci-calde"
Evaluări client pentru "Pungi reutilizabile reci-calde"